Each 36 piece dual tip marker pen set comes in a professionally design presentation box and a plastic carry case for easy storage, clean up and transporting. 36 EXCITING COLORS, great for office stationary back to school and craft projects. Great intensely brilliant colors create vibrant long lasting impressions. Dual tip maker pen set art kit is perfect for drawing, coloring, office, home, and crafts projects. This is the ideal set of coloring markers for school and office use. Children love the vibrant colors and dual tips, making school projects fun and interesting with a variety of coloring techniques. Teachers love these marker sets because they are watercolor and easy to clean and packing away is easy. A great all round product that can be used at home, in the classroom and in the office. >. 36 EXCITING COLORS, great for office stationary back to school and craft projects. Great intensely brilliant colors create vibrant long lasting impressions. Dual tip maker pen set art kit is perfect for fine art techniques, card making, illustrations, sketching, painting, drawing, coloring, manga, graphic, design card making, calligraphy, hand-lettering, doodling, journaling, rapidograph, novelty projects, design animation, perfect for the classroom, office, home, and crafts projects. >. PRESENTATION BOX and plastic carry case. 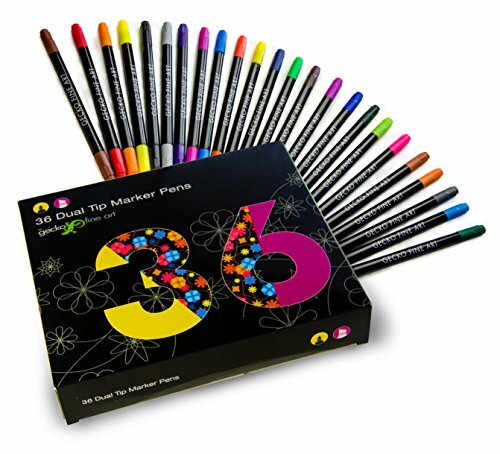 Each 36 piece dual tip marker pen set comes in a professionally design presentation box and a plastic carry case for easy storage, clean up and transporting to school or for office stationary use. The presentation box makes this an ideal gift for birthdays and christmas presents. >. BACK TO SCHOOL & OFFICE STATIONARY This is the ideal set of coloring markers for school and office use. Children love the vibrant colors and dual tips, making school projects fun and interesting with a variety of coloring techniques. Teachers love these marker because they are watercolor and easy to clean and packing away is easy, each set comes with its own plastic carry case. A great all round product that can be used at home, in the classroom and in the office. If you have any questions about this product by Kraftfun, contact us by completing and submitting the form below. If you are looking for a specif part number, please include it with your message.